At an age when franchise blockbuster cinema has turned into mega-budget versions of old 50s serials, where it's damn near impossible to enjoy a stand-alone story without the annoyance of having to wait years to see the next installment, Rogue One: A Star Wars Story should come as a welcome respite for fans and general audiences alike. Old school fans are familiar with the Expended Universe, a series of novels that spin off of the familiar saga of the Skywalker family in order to explore the rest of the vast Star Wars universe. Watching Rogue One is like experiencing an excellently executed Expanded Universe novel on the big screen. Yes, it's a prequel to A New Hope, and there's enough fan service to directly tie it to the rest of the franchise, but it also stands alone as a single story to be enjoyed in one sitting, with well-developed characters, an engaging plot, and a rousing adventure that's more than worthy of carrying the Star Wars brand into new and exciting territory. As enjoyable as The Force Awakens was, it also carried with it a backlash concerning its familiarity to the previous films, raising fears that the new Lucas-less Lucasfilm will lazily copy and paste the original trilogy as a cynical attempt at exploiting nostalgia. I gave it a pass as far as that issue was concerned, considering Episode VII a bridge between the old and the new, while remaining hopeful that the following installments would be able to escape the giant shadow of the original trilogy and stand on their own. Rogue One is almost a more crucial test than The Force Awakens as far as the originality of the new Disney-owned step of the franchise is concerned, since it's tasked with creating a unique style and a stand-alone narrative that's supposed to represent the future of Star Wars. Director Gareth Edwards and his team pass that test with flying colors; delivering a spectacular spin-off adventure that embraces its own style while unequivocally belonging to the Star Wars universe. This is the first live-action Star Wars feature that doesn't begin with an opening crawl, doesn't revolve around the Skywalker family, doesn't use wipe transitions, brings characters that would have been sidelined in official episodes into the foreground, and is allowed to tell a more intimate story without having to attach itself to an epic vision. The film, and I can't stress enough how happy it makes me that this is a "film" and not an "episode", tells the story of a group of rebels that sacrifice everything in order to steal the plans to The Death Star. Right off the bat, the filmmakers are faced with a storytelling challenge: How can they create suspense and excitement when everyone who's ever seen A New Hope knows the outcome of the mission at the center of the plot? Edwards and the four credited screenwriters manage to go around that problem by patiently developing the characters during the first act, instead of frontloading the movie with the expected action set pieces. 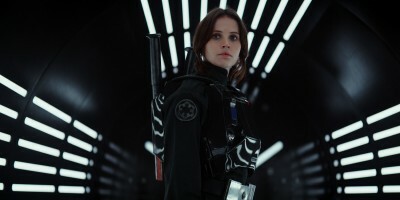 Some fans might feel antsy at the fact that there isn't a show stopping battle sequence until well into the second act, but getting to know the characters, and seeing the gravity of this impossible mission through their eyes, is integral to having the audience forge a personal connection to Rogue One's story. And believe me when I tell you that the non-stop action that dominates the third act, reminiscent of the Battle of Endor from Return of the Jedi in the way it kinetically intercuts between ground and space conflict, will more than make up for the lack of convenient set pieces during the first half. At the center of this ragtag team of rebels is Jyn Erso (Felicity Jones), a rowdy rapscallion with a Han Solo-light character arc, moving gradually from self-centered survivor to passionate rebel fighter as she realizes that the survival of the alliance against the Empire might rely on her bravery and sacrifice. Her frail relationship with his father Galen (Mads Mikkelsen), the unwilling builder of the Death Star, not only provides the story with its emotional core, but efficiently plugs up a famous plot hole from A New Hope regarding the placement of an oh-so-familiar exhaust port. The other characters that surround the mission, ranging from a loyal rebel soldier (Diego Luna) with a morally conflicting mission and a reprogrammed Empire droid (Alan Tudyk) who's a more confident yet somehow sassier version of C-3PO, are all interesting and relatable. But it's Donnie Yen, who plays a badass blind follower of the force, a Jedi Zatoichi if you will, who steals the show. As much as Rogue One has to stand on its own, it's also of course obligated to provide fan service in order to stroke the audience's nostalgia. Some of them are fun (The quick appearance of two minor but instantly familiar characters from A New Hope), some are downright awesome (Perhaps the most iconic character of the franchise brutally wreaking havoc made me giggle like a schoolboy), and some are grating (A wholly unnecessary cameo by two famous characters). A decision to use CGI to bring back a human character all fans know and love is incredibly distracting, and represents the lowest point of the film. The technology to organically mix human actors with CG humans is still not quite where it should be, so I wish they'd have hired an actor who looked like that character instead, especially considering the fact that they present a perfect example of this practice in the same movie (The person they hired to play Mon Mothma looks exactly like the actress from Return of the Jedi). More than The Force Awakens, Rogue One represents exciting new possibilities for the Disney-Star Wars merger, while offering a wholly satisfying side story from the vast Star Wars universe. It was about time the franchise headed into uncharted waters.